With all the new 2018 Wall Calendars being created by our members, we thought it would be great to create a page to view/purchase any of the available artist calendars. 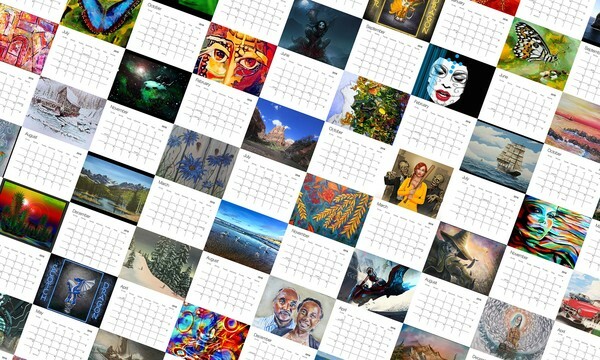 We have now created this "Browse Calendars" page and it's promoted on our home page as well as our main Browse Artwork page. Any member calendar that is created and activated will now show up on this page. You can now enjoy looking through each of the 2018 calendars that have been created by our members. If you really like one of the calendars, we invite you to purchase one. If you have not created your own calendar yet, learn more on this blog post. January 2nd 2018, when one tries to show the calendar on facebook it does not show the calendar but gives the portfolio! It confuses people! Can't we do one or the other? Ginger - At this time, if you share any page in your portfolio (gallery, contact, bio, blog, video, calendar, etc.) the default image that is shared is your gallery images. This is how the code was setup to work with the artist portfolios, which the calendar is a part of. To make changes to this, will require quite a bit of work and restructure of our artist portfolio. Because of this, we are not able to do this change this year, but we will consider making this change you have suggested as part of the upgrades for next year's calendar. Thanks for the feedback.